In response to a post on the challenges of research on food, James responded with an email recommending I read “The Diet Myth” by Prof Tim Spector. I’ve been working my way through this fascinating book in the past few weeks and one of the anecdotes in the book that’s stuck with me is an experiment he ran with Tom, his son, as a test subject. His son had a simple task – stick to a diet of McDonalds for 10 straight days so we can see its effects on your gut bacteria. Through the course of the book, Prof Spector explains the key role gut bacteria plays in our health. There’s been a growing body of research on the subject too. This post, however, isn’t about that (more on that later). This just looks at the effect the McDonalds diet on his son’s health and gut bacteria. Below are a couple of excerpts from Tom’s article in The Telegraph. Straight after the experiment, I drove to the supermarket and got two big bags of salad. I ate them all. I was over the moon. And the test results were fascinating. I’d lost 1,400 bacterial species in my gut in just 10 days, which was extraordinary. After a week back on my normal student diet I’d recovered a bit but not completely. I still don’t know if I’ve completely restored the diversity of species to my gut. I was the first person to look at the gut microbiome change on a McDonald’s diet, but I’m just one person. In terms of scientific reliability, that doesn’t score well. But we sent samples to three different laboratories, who tested in different ways, and my results did show really interesting trends across all three. The experiment has definitely made me think about the bad food that I am eating. I used to work as a commis chef, so I can cook. I’m eating a lot more fruit and vegetables. By the end of the 10 day experiment, Tom had lost a devastating loss of microbiome diversity (1,400 less species in the gut), a loss of appetite, lethargy, and constipation. The fascinating part to me is that all it took was 10 days.. This might just be the first ever A Learning a Day food recipe. 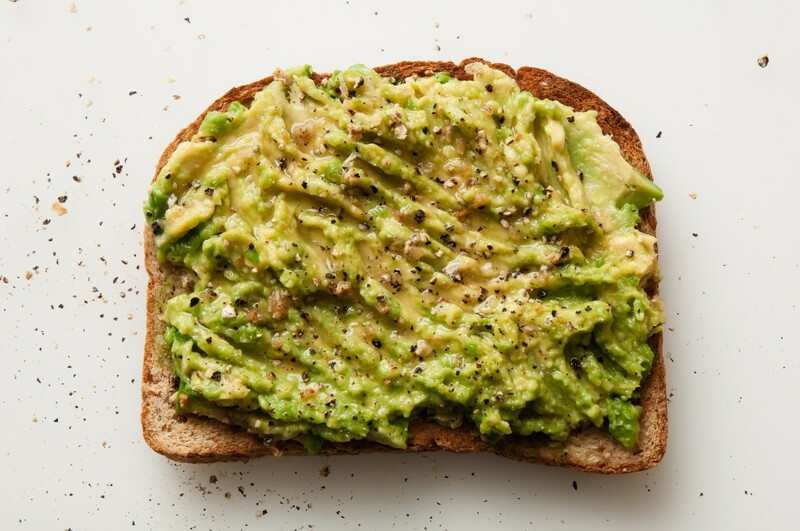 I thought it fitting to write an ode to the awesomeness that is Avocado toast. If you haven’t tried it yet, I hope this post helps. We discovered Avocado toast thanks to a close friend who made it for us during a trip in December. It has become a weekend breakfast staple since. We love it because it is easy to make, has a long list of health benefits, and is filling. It is especially good when you have physical activities lined up after breakfast as you don’t get hungry for a few hours. 1. Buy an avocado. :-) When you do see an avocado at the store, look for avocados that feel soft when you hold and press them. Softness = indicator of ripeness. If you aren’t planning to eat the avocado for a few days, go for the hard ones. And, refrigeration helps lock in ripeness for 4-5 days. 2. Cut the avocado into halves, remove the seed, and extract the fruit with a spoon. This is quick and straightforward with ripe avocados. 3. Add some salt and pepper for a simple version of the spread. For more interesting versions, try some mix of lemon juice, oregano, and chili flakes. 4. Toast your bread, feel free to boil or cook an egg, and enjoy your breakfast. Imagine a magic powder—colorless, odorless, and tasteless on its own—that you can sprinkle onto any savory food to make it taste even more amazing. Where could we possibly find this pixie dust of deliciousness? In fact, it’s all around us. Monosodium glutamate, better known as MSG, is a natural component of foods from tomatoes to peas to walnuts, and appears in extra-high levels in foods that have been fermented or aged: think of flavor bombs like miso, parmigiano cheese, or preserved fish. For the last hundred years, it’s also been available dirt-cheap in the form of sparkly little crystals. And that’s where the story gets interesting. The invention of pure MSG in 1908 set the stage for a global revolution in food, as the additive became a staple in Asian households and Western food processing facilities alike. Then, a few decades ago, MSG fell victim to a massive backlash, prompted by shoddy science and more than a little racism. We’re only now starting to emerge from the scary days of glutamate hysteria, thanks to chefs like David Chang, and it may not be long before those tasty flavor crystals reclaim their rightful place next to the salt and pepper shakers. This story speaks to the challenge with food research and food trends. I have definitely seen this with Indian cuisine. There was a time when coconut oil (a staple where we are from) was labelled “bad” thanks to some shoddy science. Then, coconut oil became “in” again. There are multiple other examples. As a result, I tend to view any new research on food with a large dose of skepticism. Food has a Darwinian nature to it – anything that survives many generations has survived for a reason. The problems we face tend to be due to new, often synthetic, additions to the diet whose effects aren’t well understood. When I saw her do it this morning, I asked myself why I don’t do it more often. Just like her, I’m clearly fortunate enough to eat good food very often. By extension, how often do I find myself saying the equivalent of “Mmm Yummy” when I enjoy the many other gifts – good health, wonderful relationships, this awesome internet, and dedicated colleagues and teams? Similarly, it is tempting for me to draw the conclusion that she says “Mmm Yummy” because she’s happy. In reality, though, it is not happy people who are thankful. It is thankful people who are happy. 1. Crops produced in large tracts of land cannot be produced without pesticides. Thanks to the nature of infections and pests, it is impossible to crops in large tracts of land without chemicals. The only way this can be avoided is by producing crops in small greenhouses. 2. Organic crops also use chemicals – the only difference is they are more dangerous and toxic. A crop is certified as organic if it uses pesticides that are naturally available. This results in farmers buying large amounts of Copper Sulphate and Arsenic and this, in turn, results in organic crop land having large amounts of (toxic) copper and Arsenic. 3. Manure is no better than synthetic fertilizer. Is having Nitrogen Phosphate via manure better than injecting a Nitrogen Phosphate molecule? Absolutely not. A chemical is a chemical. In fact, the cost of producing manure (i.e. the cost of raising a cow) is much higher in terms of carbon footprint and environmental effects. 4. Chemicals and genetically modified (GM) food are the future. Most of the available Papayas in the world are already genetically modified. This is going to be an increasing trend. We need technological advances in seeds and food to ensure we’re able to feed 10 billion people on this planet. 5. Organic will (unfortunately) remain a premium/luxury product. Organic farming will unfortunately be a tax on limited land. However, it will remain a luxury product. One can only hope that farmers and the FDA will understand the problem of shoving large amounts of Copper Sulphate into the soil. Heroin is naturally available and that does not mean it is good. 6. Farm-to-table is the way to go. The trouble with mass produced crops is that these are often plucked/picked before they are ripe and are ripened en-route to their destination by artificial means. We are better off eating ripe food and, as a result, the farm-to-table movement is very positive. Farmers markets are going to be the key to healthy eating. 7. The rules are different when it comes to mass producing meat and poultry. My understanding of this side of the industry is limited. My understanding so far points to organic being the way to go here. This is because the industry increasingly uses heavy injection of antibiotics and hormones into cattle and poultry in their bid to maximize output. Organic and “free-range” meat and poultry seem to be the way to go. The big learning? Treat “organic” with healthy suspicion. Understanding how the food you eat is produced. And, remember, things are increasingly not the way they seem. That sounds tough and sobering.. it is intentionally so.